I have started this series out of order, I have read the third book, A Talent for Trouble, first. However, even though I've read out of order, they still work in reading them. 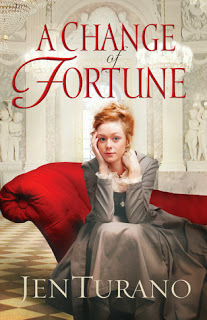 A Change of Fortune is similar to A Talent for Trouble with the fact that they are both fun to read! There is humor spread through out the story, even during the climax of the story, there is humor to carry it through. I sailed through this book so quickly. It was hard to put down. Lady Eliza Sumner was a fantastic lead. She has the right mix of ingenuity, pluck, and fortitude. The humor she brought to the story was subtle and done with out it being forced, while Hamilton Beckett brought the little more stern and serious side to the story. He was a great balance. Even though he was a serious character, he also knew when to laugh. I enjoyed A Change of Fortune. If you need a laugh or a smile this story is for you! I can't wait to read the second story in the series. I found your blog through Rissi's blog Dreaming under the same moon. I really enjoyed this book. Your right, it does have funny moments!